Siem Reap has a tropical climate with seasonal variations typical of all of Cambodia. 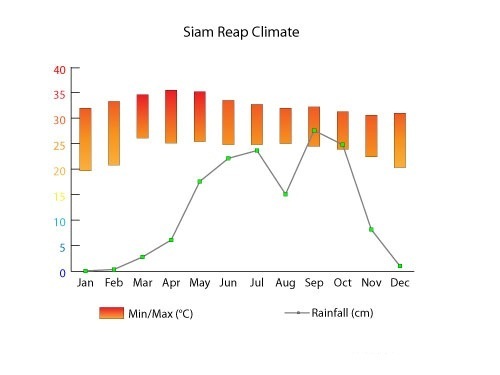 The dry northeast monsoon season runs from December through April, while the southwest monsoon from May to November brings wet weather and high humidity. The best time to visit Siem Reap is in December and January, when the days are assuredly sunny and dry. Just be aware that this is the peak tourist season, so you'll find it more crowded everywhere and prices will be higher.